I drive across town from Henderson to Summerlin to be examined by Dr. Yesnick. 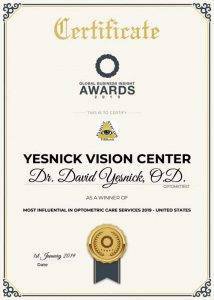 He is highly intelligent and went through 8 years of higher education, 18 years of experience and 8 of those years at the Yesnick Vision Center. I don’t feel like “just another patient” when I go there as he genuinely seems to care about giving my wife and I the best possible solutions to our eye health while consulting us on alternatives based on budget. He also allowed my wife and I to use his equipment to look at each other’s eyes which was pretty fascinating. I always have a good experience when visiting. He is very knowledgeable and keeps up with the latest technology in everything he and his team have to offer. For me that pretty much means that every time I get a checkup I walk away with the most comfortable advanced lenses to date that I didn’t even think was possible.  Overall I would recommend seeing Dr. Yesnick for all checkup and health needs. 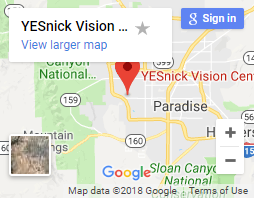 When it comes to buying products from there, if you don’t agree with the price don’t feel obligated to shop there… As a side note if you are even thinking about the possibility of Lasik surgery you should mention it to Dr. Yesnick as he was hugely helpful and informative and he works closely with THE BEST Lasik Surgeons in Nevada.